It is always heartbreaking when an animal is surrendered to a shelter—even more so when he or she has been in the same home for a long time. Animals, like people, grow attached to their family and surroundings, and pet relinquishment is never easy. In fact, we have an entire team dedicated to helping pets stay in their homes, but we understand that sometimes it is simply not an option. In those cases—like that of a Lab/pit bull name Peach—we work hard to ensure that the pet finds a new, loving family as soon as possible. 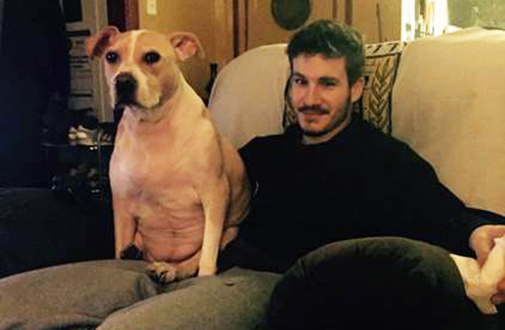 Fortunately for Peach, her second home proved to be precisely “where the heart is.” Here is her Happy Tail. Peach’s story began all the way back in 2008, when the ASPCA rescued her from a cruel situation. She was just nine months old at the time, and she appeared to have struggled with poor nutrition when she was very young. The precious puppy’s growth was stunted, and she had a mild respiratory infection. After receiving treatment at the ASPCA Animal Hospital (AAH), Peach was soon adopted, and we happily sent her on her way. Fast forward to September, 2015. 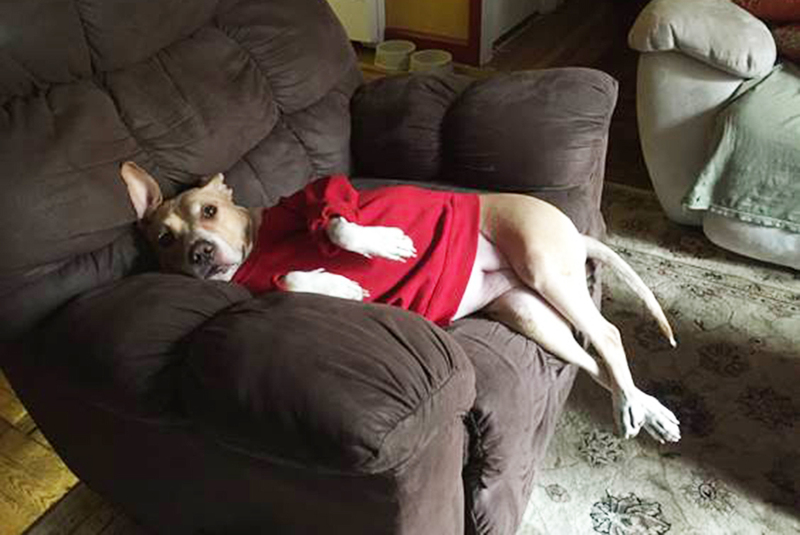 Peach’s adopter was moving to a place that did not allow pit bulls, and she was forced to return her to the ASPCA. It was a sad scene, but the adopter had no other option. To make matters worse, Peach was now eight years old—a senior pet. She was also overweight and had two tumors on her thighs. At AAH, veterinarians assessed Peach’s tumors and determined that, given their location, they could not be effectively removed. Though it wasn’t possible to predict the course of her cancer, we knew that in time the tumors were likely to grow. We decided that the best thing to do for Peach was to find her a loving home, and fortunately, it wasn’t long before we met Eitan. Eitan had recently lost his childhood dog, Tootsie, and was missing the companionship of a canine. “I preferred to get a dog that really needed a home,” he said, so he decided to visit the ASPCA Adoption Center. Peach was the very first dog he saw. “She was older and had cancer, so I figured no one would take her,” Eitan recalls, and on November 30, she became an official member of his family. In the months since her adoption, Peach has done incredibly well. She is on a prescription weight loss diet and her health is stable. 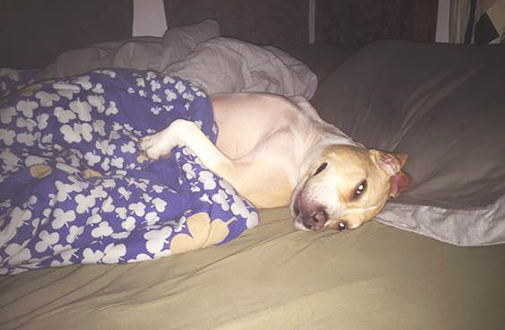 Eitan says, “She has become my best friend, roommate, confidante, and alarm clock.” We are so happy that this special girl has found a warm, loving home with Eitan, and we wish her continued health and happiness for many years to come. After all, this is one Peach who deserves all the sweetness she can get!